On June 23, 2003 The Flushing Jewish Center and the Fresh Meadows Jewish Jewish Center consolidated(merged) to form the Flushing-Fresh Meadows Jewish Center. The dedication ceremony was held on Sunday, September 21, 2003. The Flushing Jewish Center was founded in 1932 under the name Kehilith Israel (Congregation of Israel) Community of Flushing an Orthodox Synagogue by a small group of Jews under the leadership of Solomon and Clara Rabinowitz. A loft above a stationery store was rented at 164th Street and Depot Lane, one block north of Northern Boulevard in the Broadway section of Flushing. Weekly Shabbat services were held. Neighborhood store keepers were called upon to make Minyons. Twenty children were in the first Talmud Torah class. Incorporation as the Flushing Jewish Center, Inc. followed in 1937. Rabbi Morris Wintner was the Spiritual Leader until 1936. A Ladies Guild was organized, later to be known as the Sisterhood. A Men's Club was active. Solomon Rabinowitz was the first President serving for a period of five years and thereafter he and his wife, Clara, remained active in the affairs of the Congregation for the rest of their lives. Sol as he was affectionally known died in 1991. Clara served as President of the Sisterhood for several years. She died in 1994.
purchased the property at 42-00 171 Street from the Griffin Estate. The parcel contained a large mansion house with an adjoining house which had served as the servants' quarters. After renovating the mansion to make it usable as a Synagogue and school, the Congregation occupied it in 1945. Rapid growth required the addition of a building adjoining the house. In 1947 construction began on a building which was to house the Synagogue and other facilities. However only the basement portion was completed and until 1958 it served as an all-purpose room and auditorium in which religious services and social functions were held. Rabbi Herman Zwillenberg, a graduate of Yeshiva University and an ordained Orthodox Rabbi served with distinction as the Congregation's Spiritual Leader from 1945-1958 overseeing the growth of the membership to 250 families with 150 children in the Talmud Torah. With the Congregation's facilities bursting at their seams, led by its then President David Berlin, a successful fund-raising effort led to the building of the Main Chapel and Social Hall which was completed in 1958. The Hebrew Academy of North Queens (HANQ) held its first classes at the Center. In 1958 Rabbi Paul Hait an ordained Orthodox Rabbi and graduate of Yeshiva University and later to become the Executive Vice President of the New York Board of Rabbis became the Spiritual Leader of the Congregation serving as such for nineteen years. To ease the overcrowded and cramped school classrooms, the old Griffin mansion was demolished in 1965 and a new School Building was erected in its place to become the Solomon and Clara Rabinowitz Religious School. During these years the Congregation was very active in community affairs and was the host and meeting place for many community organizations. It was a charter member of the Queens Jewish Community Council and subsequently of the Flushing Jewish Community Council. It participated in raising funds for the UJA-Federation, Israel Bonds, Yeshiva University and the Women's League for Israel. It sponsored educational programs together with other Synagogues. The Sisterhood sponsored many events and programs for the Center and throughout the years raised much needed funds which it turned over to the Center. The Men's Club and a Couples Group were active to enhance the Social life of the membership. Bnai Brith and Zionist Organization of America Chapters used the Center as their meeting place..
Because of demographic reasons, the membership began to decline in the 1970's. In 1977 Rabbi Earl Fishhaut, an Orthodox Rabbi and Graduate of Yeshiva University became the Rabbi of the Congregation serving it for twenty-six years. Lack of children led to the closing of theTalmudTorah. was the learning institution for over 300 children and presently is located at the Hollis Hills Jewish Center. In 1996, the Flushing Jewish Center endured a disastrous fire which destroyed its Main Chapel and Social Hall. Despite the fact that only 50 families remained in the membership, they were determined rebuild the Center. With the proceeds of the insurance, the generosity of many people and businesses with their donations, the help of neighboring Congregations and the QJCC and FJCC, a grant of the UJA- Federation and the tireless efforts of the membership, the rebuilding was completed in 1998 at a cost of One Million Dollars. The Congregation membership continued to decline, daily services were reduced and finally discontinued due to lack of minyons. When the Shabbat morning service barely had a minyon, the Congregation investigated the possibility of a consolidation (merger) with a nearby Synagogue. Negotiations with Fresh Meadows Jewish Center followed and in 2002 entered into a Plan of Consolidation with Fresh Meadows Jewish Center in which the two Congregations agreed to become the Flushing-Fresh Meadows Jewish Center and obtained approval for the Consolidation from the Supreme Court-Queens County in 2003. Fresh Meadows Jewish Center began life in 1949 when a local resident, Leonard Levy, went door to door looking for Mezuzas on the door and the inquiring of the resident if he would be interested in being part of a new Synagogue forming in the area. Early meetings in the homes of Thelma and Leonard Levy and Ruth and Harry Krieger resulted in Isadore Schwartz being elected the first Center President. A sisterhood was formed and at a meeting in the home of Sara and Sam Rosof and with 20 women attending, Sara Rosof was elected its first President. That year the first High Holiday Services were held in a rented store on Horace Harding Blvd and 183 St. In 1950 High Holiday Services were held in a larger store. Hebrew School classes were begun and held in the basement of Ruth and Isadore Schwartz. Victor Kops was the first Principal. As local interest grew and as more and more Jews with young families came into the neighborhood it was recognized that more permanent quarters would be necessary. At that time the Long Island Expressway was not completed in the Fresh Meadows area ( Horace Harding Expressway was the main East-West throughway) and the State had condemned many homes along the route of the LIE making a parcel of land available. The early FMJC leaders seized the opportunity and obtained the land upon which our current buildings stand. Fund raising activities for the first phase of a building program was held in a tent on 193 St. and Peck Ave. The first construction was an all purpose building; Sanctuary, social hall and Office in what is now our ballroom with Hebrew school in the basement was completed in 1951. The present Bessie and Harry Feinerman School building to house the increasing student body was completed in 1959. At about this time a Gas Station offered to buy the part of the land not being used by the Center. Fortunately our leaders had other plans. Our beautiful Anna and Louis Zweig Sanctuary, completed in 1966, proudly stands on that land. The new Jewish Center’s first Rabbi was Rabbi David Gordon who served the Congregation until 1980 when he retired to Florida. He was replaced by Rabbi David Fine a young man who came with his wife, Helene and three young children. He left in 1985 to become the Rabbi of a Shul in Chappaqua, NY. Rabbi Pilavin was with us a short while to be replaced by Rabbi Waidenbaum who is now the Rabbi of Rego Park JC. We then obtained the services of Rabbi Dr. Gerald Meister who was with us until 1999. After he left the duties of Rabbi and Cantor were put in the capable hands of our long time Cantor, Chaim Silberman. 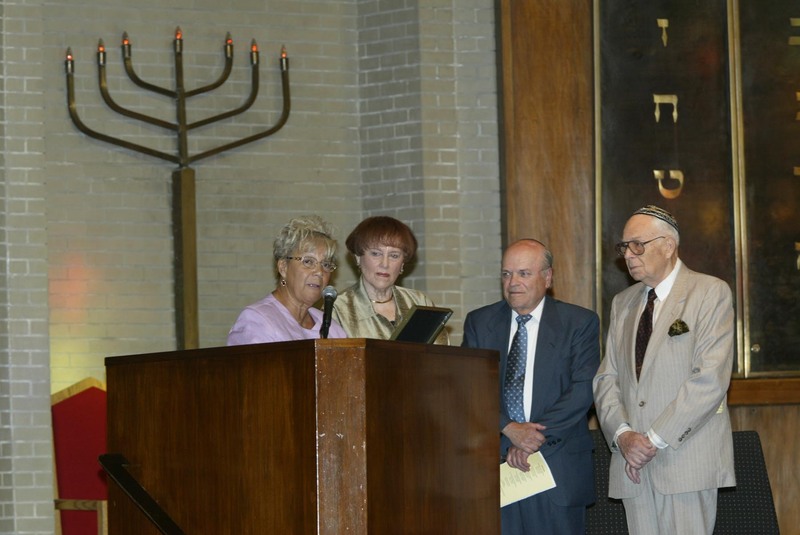 After the merger in 2003, Rabbi Gerald Solomon was appointed our Spiritual Leader. In July of 2004. Cantor Silberman retired to Israel in 1966 and a search led to the appointment of Cantor Mordechai Dier who was with us until 2011. He was replaced by our current Cantor, Aaron Katz. Flashes of memory…. Rabbi David Gordon, our first Rabbi; Cantor Morris Romalis z’l, who led Services and was the beloved teacher of our Bar and Bat Mitzvah boys and girls; Our wonderful Sisterhood choir led by Jerry Goldstein; and who can forget the plays and musicals performed by our wonderful young people? ; Hebrew School graduations; High Holiday Services with Sanctuary seats filled with people to the back and the overflow at Services in the Gym. Lou Berland brought his Starlight Caterers to us in 1959, beautified the ballroom, constructed the “Smorgasbord” room and made fabulous parties which brought us a most welcome income. Friday Night Services followed by Oneg Shabbatot. Our newsletter “The Beacon” was started by Dr. Bert Faerber in 1966 and continues to this day as “The Bulletin”. We remember Men’s Club, Sisterhood, Bazaars, Purim Carnival, UJA dinners, Israeli Bond Breakfasts. Queensboro Hill Jewish Center officially was born in 1951 but its pregnancy started much earlier after WW2 ended and returning veterans and their families needed housing that was being provided in the Queensboro Hill area. It was not long before that the many Jewish families who had moved here began to feel the need to meet and identify with one another. Meetings in people’s houses, and then a candy store on 184th Street and the Science Building of Queens College. The first High Holiday Services of the nascent Congregation was held at the Hillel Foundation of Queens College. In 1952 the Congregation moved to its first home, a storefront on Horace Harding Blvd. When space was needed for larger functions like Officer Installations and Purim Masquerades, they were held at our Sister Congregations Flushing JC and Fresh Meadows JC.It was also in 1952 that some 150 families committed themselves to the dream of a larger home for the growing Congregation by becoming founders of QHJC. In 1953 a land search started by Al Babushkin resulted in the purchase of the land that QBHJC was built on. That year High Holiday Services were held in a tent on this site. One of the founding members, Herman Spinner, acted as the Cantor and Sidney Storch conducted Services and acted as Bal Koray until his death in 1990. In later years other Cantors would be appointed to serve the Congregation. We call to mind Cantor Morris Robb, Cantor Berger, Cantor Balaban and Cantor Kahan. In 1954 a young Rabbi Albert Thaler was hired to be their Spiritual Leader. It was an inspired choice and for the next 26 years he and the Center grew together in age, wisdom and accomplishments. The Temple building was built in stages. In 1956 the section housing the Ballroom was constructed. In 1959 the school wing was added and in 1966 the beautiful Sanctuary and Office wing was completed. The Hebrew School grew and at times had as many as 600 children on its roster. Adult education flourished. Love for Eretz Israel was expressed by participation in Israeli Day parades, UJA and Israeli Bond functions trips to Israel, etc. Fondly remembered was our Sabbath Institute that became a Kallah. Eventually over 100 families went yearly to Hotel Gibbers in the Catskills to spend Shabbat together, studying an experiencing the joy of Jewish Fellowship. After Rabbi Thaler left to take over the pulpit of Temple Gates of Prayer he was succeeded by Rabbi Aharon Shapiro, Rabbi Barbalot and then by Rabbi Phillip Rabinowitz, who commuted from Philadelphia each week-end to lead the Congregation. Such was the golden age of the Conservative Synagogues of North Queens. Our children grew up, married, started families and moved away. The demographics of the neighborhood changed as neighborhoods seem to do and the membership of the various Jewish Centers dwindled. Finances were naturally adversely affected and it was seen that something had to change. Fortunately we had leaders with the vision to see what had to be done. Anita Bernstien President of FMJC and Byron Dresner, President of FJC with the interest of insuring the survival of both Congregations started investigating the possibility of consolidating the two Congregations. To their credit they were able to lead the two Congregations through the complicated negotiations to a successful conclusion that resulted in the Flushing-Fresh Meadows Jewish Center. In 2007 QHJC, facing the same desperate situation joined the Merger. While it was very difficult for Flushing Jewish Center and Queensboro Hill JC to leave their “homes”, ultimately Congregations are not just bricks and mortar but are the Flesh and Blood of people who have the Sprit to continue a 5774 year old tradition. And that is what continues to live on in the Congregation of FFMJC..